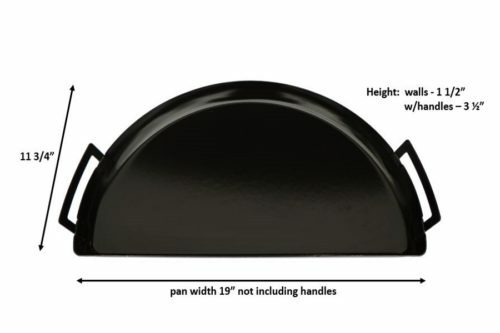 The Drip ‘N Griddle pan comes in one size and works great in 22″ or 26″ kettles and the Weber Summit Charcoal Grill. 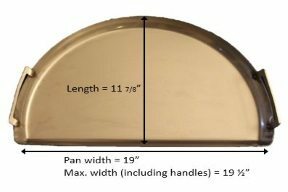 (There aren’t any future plans for a 26″-specific pan). Nearly 4 pounds of high quality 304 stainless steel includes hand-welded, easy-grip handles to make moving it around safe and easy. Easy to clean – and dishwasher-safe too! Drip ‘N Griddle Deluxe – same 304 stainless steel construction you love, new outside-welded handles and sleeker lines. 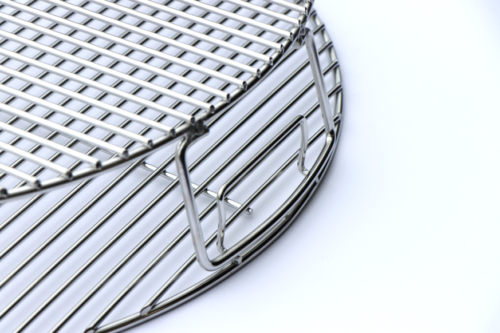 Comes standard with a 304 stainless steel Roasting Rack. Drip ‘N Roast Pan Deluxe – identical in size to the Drip ‘N Griddle, but made from porcelain-coated steel. Comes standard with a porcelain-coated Roasting Rack. Note: We are not offering Combo Packs with the Drip ‘N Griddle Pan. All Combo Packs ship with your choice of Drip ‘N Griddle Deluxe or Drip ‘N Roast Deluxe (with corresponding roasting rack). Free shipping to the lower 48 U.S.! All orders received before 3pm Eastern time Monday – Friday will ship same-day. All orders ship with free ground delivery. Click here for the service map to determine the transit time to your location. Upgrades to 2Day Express shipping are available at checkout for a flat rate of $10 per order. 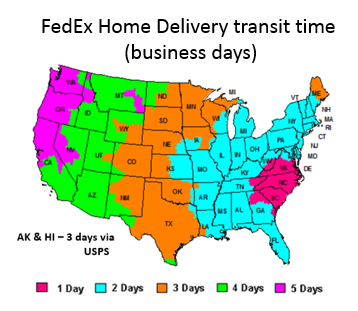 Residential delivery via FedEx Home Delivery occurs Tuesday through Saturday. FedEx Express (2Day) service does not deliver on Saturday. Thermometers and merchandise ship via USPS 2-3 Day Priority Mail. Standard delivery days are Monday – Saturday. Standard shipping via USPS Priority Mail (2-3 day transit). Place your order on our website – shipping options and prices are available in the shopping cart. Please enter your location details in the “Calculate Shipping” box to see prices. We have distributors in many international locations. Please visit the Shipping/Where to Buy page for details. No local distributor? We are happy to ship world-wide. If shipping details are not available in our shopping cart, please email us at info@abcbarbecue.com for a shipping quote. Pan does have sharp edges and should be smoother. I had to use a file to smooth out sharp edges and file down points. Drip pan, yes, griddle no. You guys have set yourself up for the bad reviews on this product as a griddle. I went through your instructions on how we are supposed to come up with the “goldilocks” fire when using this; neither too hot or too cold. First time because of the worry of warping I get a fire that looks like your photo and get a grey burger, no crust. Second time, I don’t wait as long and I get a warped pan. Why don’t you guys come up with a set of instructions with number of coals, grill temp, etc.? Bottom line this steel is too thin to take the heat variation. Expensive drip pan. There are other griddles on the market that can take the heat. 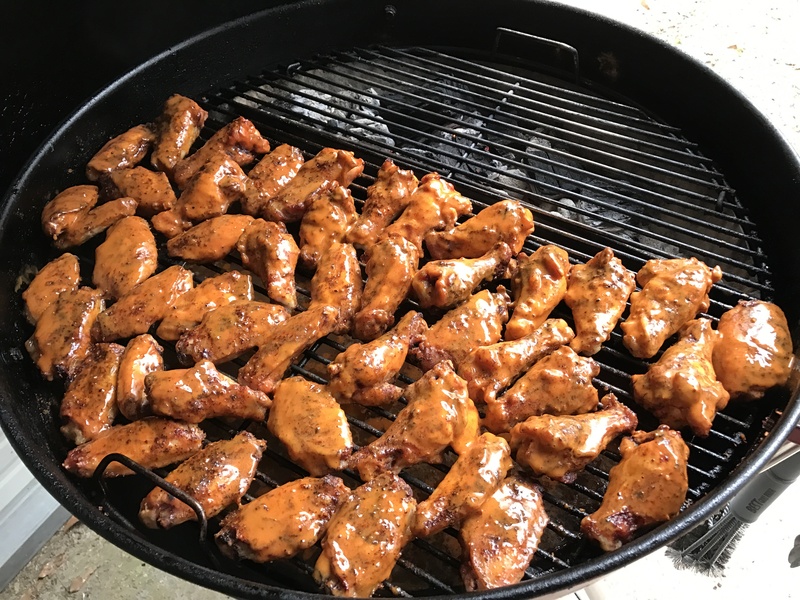 Perfect addition to your Weber grill ! 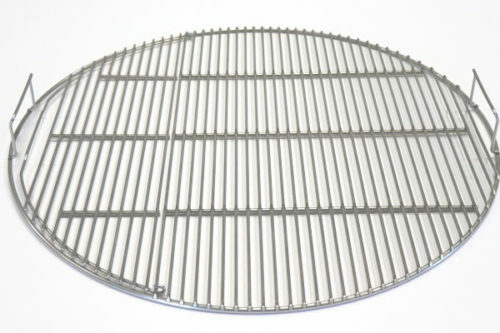 This is the perfect drip pan and Griddle for the Weber Grill ! I wish I had it years ago ! Thank you. Great addition to the SNS whether I’m using it as a drip pan or Griddle, anyone looking at buying the SNS do your self a favor get the Drip n Griddle right away. Bought my Weber kettle in November 2017. Using the SNS and DNG has made a kettle novice like myself look like a professional. Everything cooks to perfection. Highly recommend both accessories. Basically this is not thick enough for a griddle. It will warp over time with the high heat. I think it is over priced for what it will do for a griddle over time. A drip pan yes ! But way over priced to the custumer!!!!!!! ps. I have the slow and sear. I use alumimum foil instead of the drip pan and it works perfect for air flow and use a drip pan on top of grate !!! Thanks for reading my review! I use my D&G as a drip pan and air flow diverter . Could not ask for a better product to go along with the Slow and Sear. Have not used as a griddle yet, will one of these days. Great company with great products. I agree with Mark. Super easy clean up! Great product and great info on the website. Thanks! 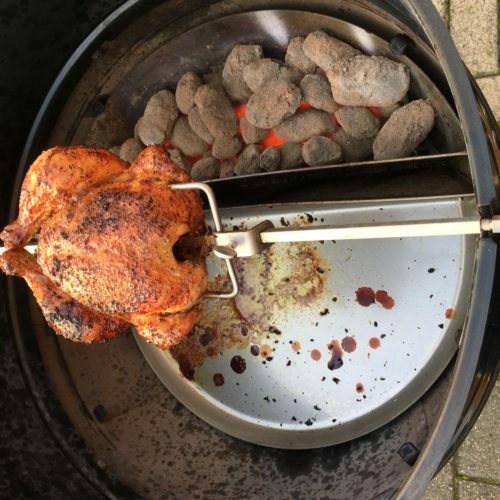 I followed manufacturer recommendations by keeping the Slow n Sear half full of charcoal, bottom of pan still warped, spins like a top when placed on a flat surface, luckily it doesn’t move around significantly when on the grill since the grates on the grill aren’t perfectly flat, and have a bit of charcoal/grease grit to keep it reasonably still, unless I have to scrape something stuck to it while grilling. 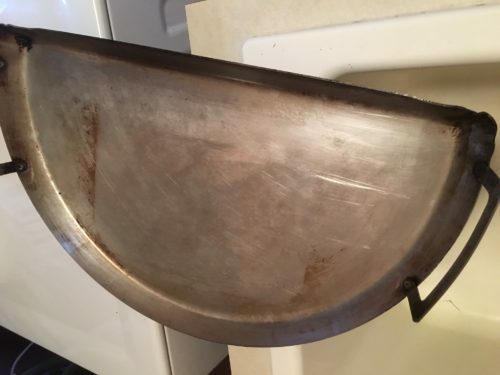 I guess If I need high heat to griddle something I’ll stick to using it as a drip pan/air deflector and do the frying in one of my cast iron skillets. Designed to snug up to your slow and sear, it creates a perfect back edge space for the circulation of air when used to smoke. 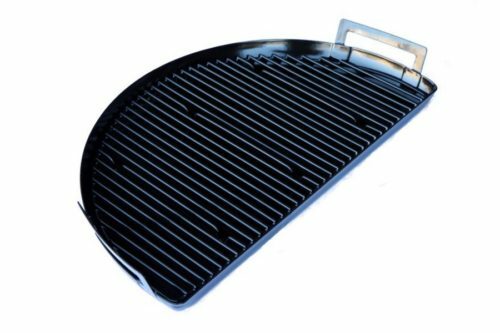 I guess you could use it as a griddle,but I just leave mine in to maximize airflow hot or slow and keep my Weber clean. If y’all were like me and had to kinda “engineer” rectangle aluminum pans to fit under the cooking surface when using the SNS this thing fixes that. I don’t use it for the griddling because I have cast iron for that (doesn’t mean I won’t try it though at some point) but it is a perfect fit. I use it for veggies for pan sauce/gravy. A bonus is that it is remarkably effective at helping with temp control by directing airflow from the bottom into the SNS. Results in a longer cook because you can close that bottom vent up a little more than normal. Highly recommend. Does 3 things and it’s the BOSS! 1 product that can do 3 things for me that make my life easier ! 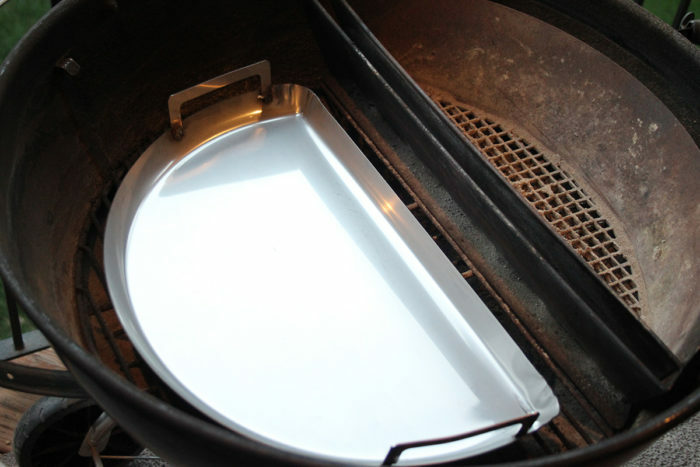 1: a large drip pan that catches way more than a rectangle pan to keep my grill clean! Clean grill means less clean up time!! 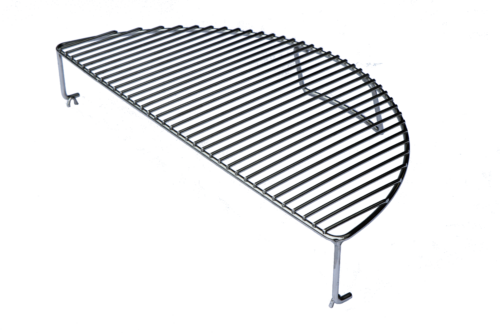 2: an air flow deflector to move air around and up & under the S’nS Plus to give super sear temps and keeps a Low & Slow cook stable. 3: using it as a griddle when you want to expand your cooking into eggs and bacon or even sloppy joes! Read the instructions and only use the griddle with medium heat ! Use it as it is intended and with recommended temps and you will be glad you own it! All of the Slow and Sear products are well thought out and purposeful and the Drip and Griddle is no exception. 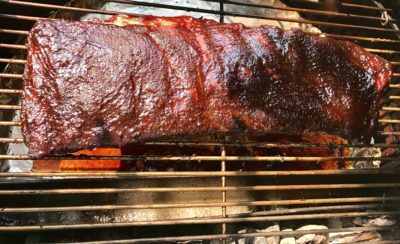 It helps with airflow through the coals when used as a drip pan with the Slow and Sear and is way more convenient than foil and aluminum pans. It is also handy as a griddle. I like to bring my thick steaks up to temp slowly using it as a griddle when I reverse seer with a few sliced mushrooms scattered around with the steaks so they can soak up a little steak juice and then finish up the mushrooms on the griddle later over the coals. Mushrooms cooked in steak juice and kissed with a little smoke are the best!!! For griddle better off using cast iron skillet. As mentioned in the product description and in the instructions that come with the Pan, yes, the it will warp when used with high heat. That is a natural property of stainless steel when exposed to high temperatures. And why we warn our customers against using it for high-heat cooking. Does a very good job of directing airflow thru SnS+ and works as a platform for a catch pan for drippings. I believe that quality control is lacking, or maybe you ship the bad ones overseas where the cost of returning faulty ones is to high to make that an option. The one I received had welding residue, big metal drops, some of which someone had unsuccessfully tried to remove, messing up the surface in the process. Yes, it would work as a (expensive) drip pan but not as a griddle in the condition it reached me. Luckily I have access to a metal shop where they know their job. There is more to quality than using thick steel. You are obviously a company that take pride in your product and care for your customers. Accidents do happen and you handled this to my complete satisfaction. Well done! I’m afraid this means I’ll spend more money on your products in the future. The pan now deserves full marks..
We are so very sorry to hear that the Pan you received didn’t live up to your expectations. Based on your description, it does not meet our quality standards either. We, admittedly, had some manufacturing issues with the pans earlier this summer but we had been assured that all affected pans had been removed from stock. Again, we apologize that this was not the case. Our customers’ happiness with our products is our #1 concern, regardless of their location around the world. We will reach out to you directly in hopes we can make sure you receive the quality product we intended for you to receive. Thank you for your review and bringing this to our attention. Mikael, we completely agree! Based on your description this pan should have never left our warehouse. We deeply apologize for the oversight and have reached out to you directly to see what we can do to make this situation right for you. I must have product. I with I had bought the drop n griddle at the same time. They go together like a team. Eggs over medium? Oh Yeah! When I asked my husband to make eggs on the Drip ‘n Griddle, he was rather dubious. I’ll tell you what, those were some of the best fried eggs we’d ever had! Too bad the summer was cut short by a couple of burn bans. PERFECT Companion for the Slow 'N Sear! I love it! When my wife bought me the Slow ‘N Sear I decided to go ahead and order the Drip ‘N Griddle, it seemed so obvious, what a great design! I can’t even imagine not using this great product. I believe it is why my temperature is so easy to control on my Weber Kettle. Best of all, clean up after a long cook is so easy! I truly love this company and the great products they make. I appreciate the Drip ‘N Griddle so much after cooking ribs, meatloaf and chuck roast, they can make a real mess at the bottom of the kettle after cooking for 3 to 6 hours for these. It turns this into a minor clean up and to make things even quicker I line my Drip ‘N Griddle with foil, clean up is a snap. Thank you ABC BBQ Company!!!!! We couldn’t believe how easily it cleaned up! And in the dishwasher no less! See my comment above about fried eggs. So I got this to go with the Slow n Sear. Just another grease trap to clean up. Not sure of any real benefit. No argument that the good folks at Adrenalin used plenty of stainless so it will clean up – but tell me again why I needed to do this? Overall my cook times seem to be slower since I put it in – could just be me screwingt around with different kinds of charcoal. I use this with a slow n sear plus as a drip pan and I couldn’t be happier. I spray the drip n griddle with some cooking spray before use and no matter how much gunk and grime are on it when the cook is over, it wipes clean with a paper towel or rag with just hot water! I use a scouring pad to brighten up the steel and it’s like new every time. Thank you ABC for two premium products. Make one for the 26″ kettle, indeed! 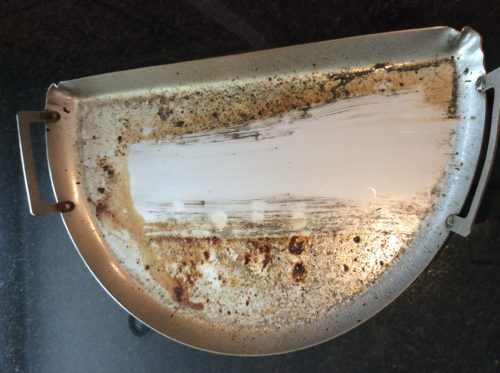 I’ve seen photos of the Drip ‘N Griddle Pan in a 26″ and there’s still a gap that has to be filled in with something like aluminum foil. So what’s the point of the pan if you’d like to use it to avoid wasting aluminum foil, but still have to use aluminum foil for the gap? The concept is great, and if I had a 22″ kettle, I’d be all over this one, but I’m guessing that there’s some manufacturing issue that’s making them hesitant on a 26″ version. Probably better to get a sheet of stainless and shape it to fit, or continue making aluminum foil moats. I first bought the Slow N Sear insert. I thought it would be good, but it far exceeded my expectations. So then I looked into the Drip and Griddle. It works great to catch the drippings and keep my Weber kettle clean. 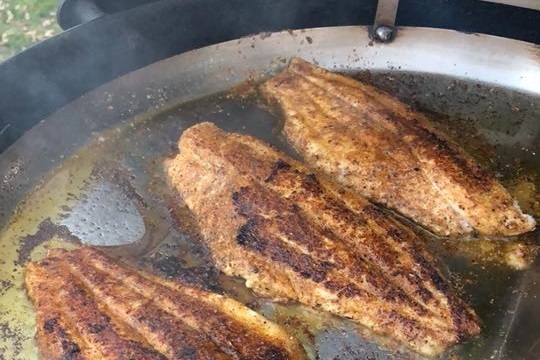 Then I started using it to cook fish. Crispy outside, moist and juicy inside. What a great innovation! Great and Easy Clean Up on this. These photos show about a week or so of cooks. It took about three minutes of light Brillo Pad work to get it this clean. I like the DnG because it keeps my Kettle clean and helps with air flow when slow cooking. My primary use for this since purchasing in November has been to have it sit next to my Slow N Sear under the meat on the indirect side. This makes cleanup of your kettle very easy and keeps the ash can from filling with gunk. Cleaning this between cooks is a breeze, just run hot water across it and drippings easily wipe off. Also works very well as a griddle on the indirect side of your kettle. A perfect match for the Slow N'Sear. Another well made product from ABC. Edges are a little sharp though. Used it for the first time yesterday for ribs. Besides the easier cleanup, one added bonus was it enabled a more stable airflow through my Kettle, hence controlling the temperature is much easier. Had it sitting at 220-228* all day, rock solid. Thoroughly recommended. I tried this once. I used it over the regular charcoal baskets. It did a great job on the bacon; however, I was disappointed in the potatoes and eggs that followed. I decided it was not the griddle; rather, I need to purchase a SnS for my 22″ in Weber and try again. 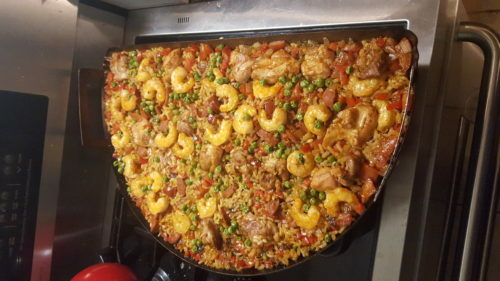 I look forward to practicing more with it and getting the technique nailed down in future cooks. It will be a great addition to the versatility of the Weber. Can’t blame the product. All errors were operator errors. 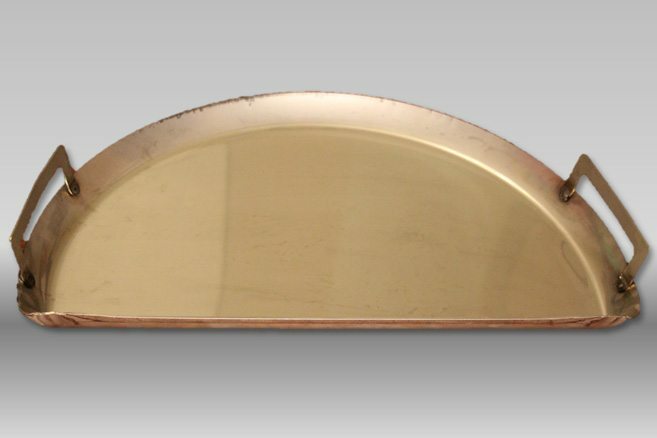 I’ve only used this as a drip pan so far, it is extremely well made. Matches up perfectly with the Slow ‘N Sear. Keeps incoming air from entering cook area. 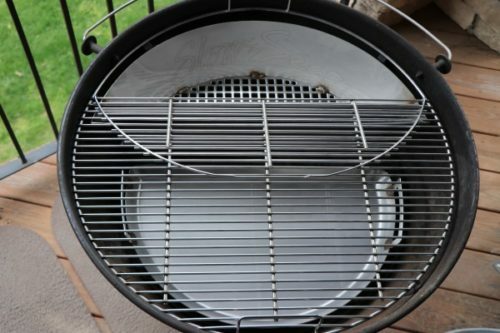 Directs air through bottom of slow and sear to keep coals burning and vents the hot air to cooking area. Also cover it with heavy duty aluminum foil,no cleanup. This is an awesome tool. When it’s not catching drips and keeping my kettle clean, it is an awesome griddle. Great cooking surface and clean up is a breeze. Essential equipment for my brisket and bacon and griddling. I love my slow n sear and a very valuable accessory for keeping things neat and keeping dripping fat in order is the drip and griddle pan. 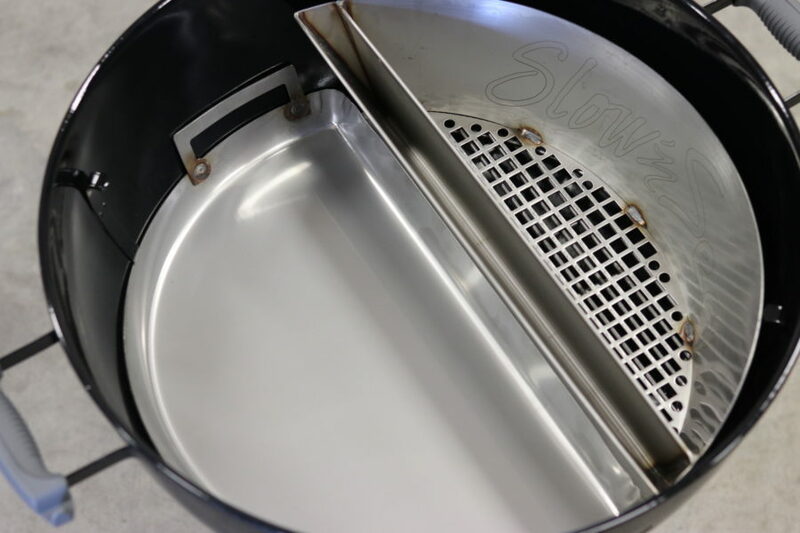 when I am doing a brisket or smoking slab bacon on the slow n sear this pan catches the dripping fat over the many hours of low and slow cooking,and makes cleanup so much easier than without it. I also use it as a griddle up top when i’m cooking something hot and fast like searing tips or doing marinated shrimp. This is one serious piece of stainless steel! The handles are a bit sharp, so wear your BBQ gloves. The unit fits perfectly next to the Slow N Sear. It serves a variety of purposes. It helps stabilize the air flow and heat considerably. 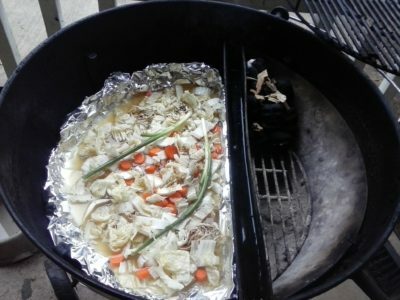 It makes a great drip pan that actually works rather than those tin foil things that never fully cover the bottom. 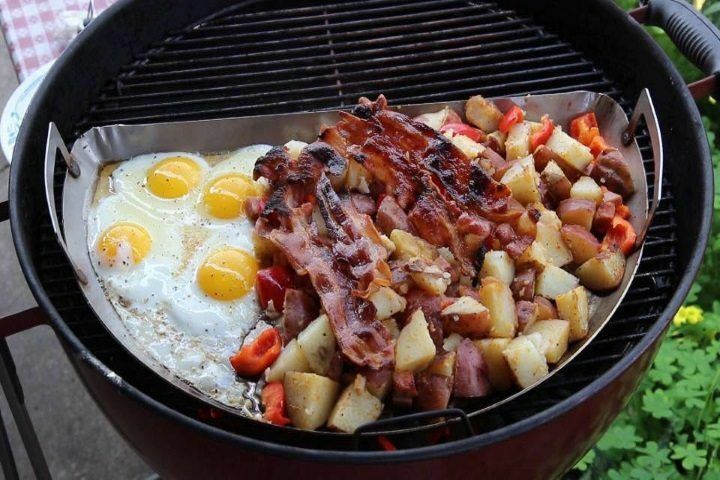 And you can use it as a griddle on top of the grill. Haven’t tried that one yet. Easy clean up. This will last a lifetime. Great product. I want to add to my review above. After a year of use, I’m loving the griddle pan more than ever. I still haven’t used it as a griddle pan, as that’s not my style of BBQ (though I have plans), but as a drip pan, it excels for three reasons. First, it fits, unlike the tinfoil rectangular ones we all use. I put a layer of heavy duty Al foil on it to facilitate cleanup. Second, and this is a little more subtle, it redirects the air flow through the hot zone rather than going straight up. This means two things – a hotter hot zone and a more stable overall temperature. Third, being heave (and I do mean heavy gauge stainless), the thing is an awesome heat sink. It takes a little longer for the grill to heat up, but the temperature is rock stable, even with the lid coming on and off. This has become a regular item in my grill whenever I do two-zone grilling. The Drip N Griddle (DnG) is the perfect compliment to the Slow n Sear. 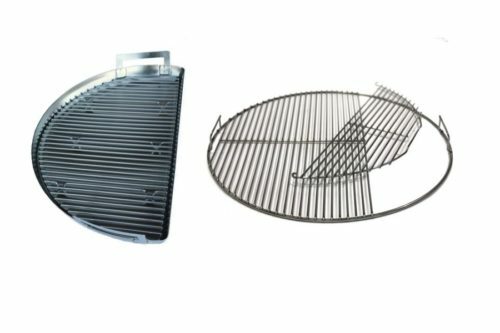 The DnG replaces the usual disposable drip pans that are used on the indirect side of the Weber kettle on low and slow cooks. Because the DnG is made from high quality 304 stainless steel, clean up is a breeze. Simply wipe off the drippings with a rag under running water. After one rinse with some dish soap, you are ready to cook again. It is that simple. As a griddle, the DnG shines when paired with an SnS. I would recommend using a half load of lit charcoal in the SnS as a full load will get the griddle surface too hot for most applications. This is far and away the best charcoal griddle I have used. Without reservation, I recommend the Drip N Griddle to any grilling or smoking enthusiast. These are fantastic! I now own four of them and they work great. Makes a supper griddle, or a pan to cook sides. 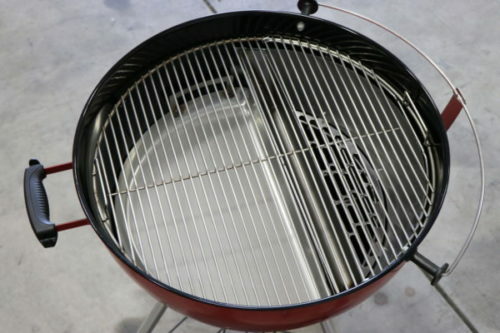 I like the half circle shape as it fits in all grills and works especially well in round grills or kettles. The slightly heavy weight keeps them in place, but not nearly as heavy as using cast iron.